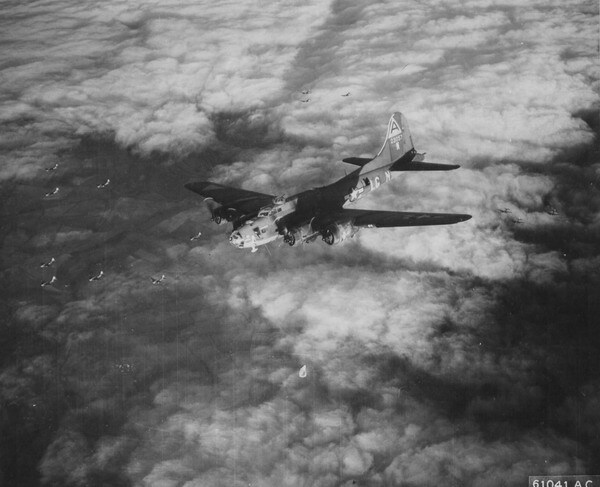 Delivered Cheyenne 18/1/43; Nashville 27/2/43; Assigned 324BS/91BG [LG-N] Wildflower 21/3/43; Bassingbourn 26/3/43; Missing in Action Oschersleben on its 38th mission, 11 January 1944 to Oschersleben, Germany. Pilot Wayne E. Murdoch chute failed to open; Radio Operator: Teddy J. Morris (2 Killed in Action); Co-pilot: Kenneth L. Manson; Navigator: George F.Young Jr; Bombardier: Robert R. Case; Flight engineer/top turret gunner: Arlo L. Roswell; Ball turret gunner: Thomas H. Rogers; Left Waist gunner: Walter T. Romanofski; Right Waist gunner: Russell B. Hoover; Tail gunner: Julius R. Sobieski – foot shot off in action (8POW-baled out over target area); Flak hits and enemy aircraft, crashed between Hornhausen and Ausleben, six miles NW of Oschersleben, Germany. Missing Air Crew Report 1918. 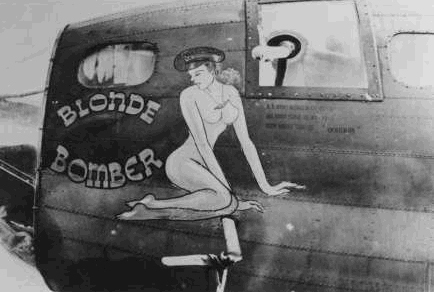 PICADILLY COMMANDO later BLONDE BOMBER.